Even on the days where she does not have soccer practice, after her regular daily routine of school, eating, and homework, she can be found outside juggling in her backyard in Huntington Beach, California. On the weekends, when she is not traveling for soccer, she is watching professional soccer with her dad. Her father got her hooked on watching professional soccer at age 10, where she continues to learn from watching the beautiful game. Her father is very passionate about the game, and pushes Nighswonger in the development of her craft. Direct about what she needs to improve on, with the understanding that she is a 14-year-old. Her mom and older sister are both very encouraging of Nighswonger’s soccer dreams, a support system anyone would be lucky to have. Nighswonger hit a new milestone in her soccer career this past summer. She was invited to attend the Nike National Training Camp (NNTC), where about 100 of the top female soccer players are brought in to train together under some of the top coaches in the country. 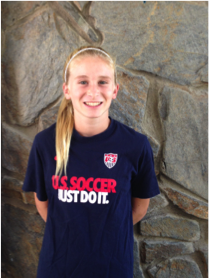 While competing at camp, she caught the eye of U16 USWNT Coach Tricia Taliaferro. A spot had opened up for the U16 Training Camp being held the next week, and Taliaferro was searching for someone to fill it. Nighswonger excelled at NNTC and very quickly received the invite to Chula Vista, CA. Later that summer, Nighswonger had the opportunity to play against the U17 USWNT while the team was in camp in Carson, CA. It was another opportunity for her to play in front of U.S. National Team Coaching Staff, resulting in another invitation, but this time it was with the U17 team. The intensity and pace of playing with older girls is motivating, and pushes Nighswonger to work even harder at developing her game. Nighswonger played attacking center midfielder during the U14 ECNL National Championship, leading the charge with her team. Both on and off field experiences in Seattle was unlike any other, drawing Nighswonger and her teammates even closer. The bond she feels with her soccer sisters is strong and continues to grow with each training session and competition. Nighswonger’s confidence on the field, as a player and a leader, grew when the final whistle blew and the dream became reality. The trophy was going home with them. “Jenna’s soccer IQ and technical ability are one of the best I have seen in my coaching career. She’s a true number 10,” said Walid Zhoury, the Director of Coaching for Slammers FC. Nighswonger’s love for the game and thirst to keep learning makes her an inspiration to others. She is a living example of making the most of life, and to do what you love, after all soccer is fun! The ECNL caught up with Nighswonger to learn more about what makes her an amazing young woman both on and off the field. A: A day with soccer practice, I wake up 6am and go to school. I come home. I eat. I do my homework, and then I go to soccer practice. I get home around 7:30, and I eat dinner. Then I take shower, and go to bed. A day without practice, I do the same thing- go to school and stuff. I come home and eat, do homework. I might watch some TV or sometimes I just go outside and juggle/get touches, or watch soccer videos. Q: Aside from Soccer, what are you passionate about? A: working with special needs people. I really want to volunteer at the Special Olympics. A: Yes. A cat, Kwame – it’s an African name. I wanted to name him Leo like Leo Messi, but my parents said no. We got him recently, within the past six months. He’s our first fur animal. We have four tortoises – Texas is the oldest one, and there are three brothers Skyler, Leota, and Pockets, they live in the backyard. We were going to get bunnies, but then my dad found a snake and you can’t have both. We ended up keeping it. Because we kept feeding it, we were worried it forgot how to hunt. He doesn’t have a name, but he is part of the family. A: I always wear this Nike headband. I have had it for a while. I wear it in every game practice too. I don’t know if it’s lucky, but it is something I do just in case. A: Eden Hazard. He plays for Chelsea. Love him! Q: Is it safe to say that Chelsea is your favorite soccer team? A: No, actually I hate Chelsea. I love Manchester United. My room is themed Manchester United. Q: Have you traveled outside of the country? If yes, where did you go? A: No. I have always wanted to go to England though. Q: To watch Manchester United? Q: What are three words to describe you? A: Outgoing, and a mix between funny and weird. I’m funny weird, I guess. A: Well…I sleep with a Manchester United blanket? I am not joking. A: It depends, it’s either 1,500 or I timed myself once and got 25 minutes. Q: If you had to sing a karaoke song, what would you sing? Q: What is your favorite food of all time? A: Chicken Tender Salad from Ruby’s. Jenna, you are an Amazing Young Woman. Thank you for sharing your story.